Comments: Jedi Master Kit Fisto is equally comfortable in air or water. R4-H5 flies in Fisto's starfighter to help navigate to help navigate and repair the ship. Kit Fisto is a repaint of 2003's CLONE WARS Kit Fisto. This time around, he comes with a new cloak Jedi robe. R4-H5 is a repaint of the figure from 2005's TSC Early Bird Kit. 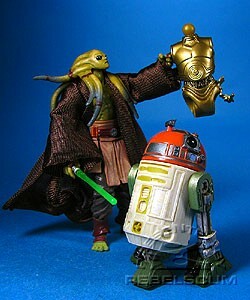 The character of C-3PX is from the Dark Horse Comics series Star Wars: Droids. He can be built by combining the extra 6 pieces from this exclusive wave.